Vacheron Constantin Series of Métiers d'art "Les Masques"
Vacheron Constantin is the world's oldest continuously-operating watch manufacturer. Luxury watches from this Geneva-based company are some of the most exquisite pieces money can buy. History's most complex pocket watch also comes from this brand. Flawless and precise – those two words best describe watches from Vacheron Constantin. The wrist and pocket watches from this Swiss manufacturer are some of the most exquisite timepieces the world has to offer. This is why Vacheron is one of the "Big Three" Swiss watch brands, along with Patek Philippe and Audemars Piguet. These three manufacturers represent fine craftsmanship of the highest quality. The reference 57260 pocket watch is one of the most famous pieces to come from Vacheron Constantin. This watchmaking masterpiece houses 57 complications, making it the world's most complex wearable watch. Its complications include a split-seconds chronograph, a minute repeater, an alarm, and a moon phase display. It also features several calendars such as a lunar calendar and a perpetual Hebrew calendar. Price estimates for this extraordinary pocket watch range anywhere from 5 million to over 10 million USD. Vacheron Constantin presented this multi-functional timepiece in 2015, after eight years of development. The Patrimony collection is one of Vacheron Constantin's most successful and sought-after collections. It is composed of classic dress watches, including flat two or three-hand wristwatches, diamond-studded women's watches, and complicated pieces with a perpetual calendar. The collection's top models are extra-flat platinum watches with a minute repeater. The sports watches in the Overseas series are also popular and have designs reminiscent of icons like the Patek Philippe Nautilus and the Audemars Piguet Royal Oak. The Overseas collection features tasteful stainless steel and gold watches. These timepieces are no less functional than those in the Patrimony collection: The Overseas is available with a perpetual calendar, chronograph, or world time function. How much does a Vacheron Constantin watch cost? The Vacheron Constantin Patrimony collection is comprised of numerous classic wristwatches. You can purchase an especially simple and flat two-hand model in white gold for around 16,100 USD. At 11,500 USD, pre-owned examples are markedly less expensive. The versions in yellow or red gold sit in a similar price range. The three-hand edition in gold with a date display at 6 o'clock costs around 22,300 USD new and 15,300 USD pre-owned. Prices for the different types of gold vary only slightly. 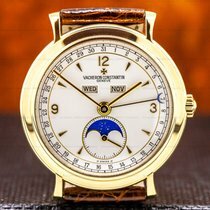 Patrimony models with a moon phase display and retrograde date are some of the most complicated in this series. You can purchase a white or red gold edition for about 41,100 USD in mint condition. There are currently very few pre-owned pieces on the market since these models first premiered a few years ago. The highlights of this series are the Patrimony watches with a perpetual calendar or minute repeater. Be sure to have about 63,400 USD on hand if you want to call the red gold model with a perpetual calendar your own. A never-worn piece in red gold with a minute repeater demands almost 296,000 USD. The platinum variants cost even more than their gold sister models, selling for about 113,000 and 363,000 USD, respectively. You will find Vacheron Constantin's luxury sports watches in the Overseas collection. Their design draws upon the porthole aesthetic of the Patek Philippe Nautilus and the Audemars Piguet Royal Oak. Stainless steel watches with three hands and a date display at 3 o'clock cost around 18,700 USD in mint condition and 15,700 USD pre-owned. Instead of the characteristic steel bracelet, the red gold version comes on a brown alligator leather strap. It also comes with an additional rubber strap. This gold watch sells for about 31,200 USD new and 26,200 USD pre-owned. With its stopwatch function, the Overseas Chronograph offers an especially popular complication. This timepiece is available in stainless steel, gold, or a bicolor combination of stainless steel and gold. You can also choose from a number of different dial colors. Plan to spend about 26,300 USD on a new steel model and 22,300 USD on a pre-owned one. Prices for mint-condition pieces in red gold sit around 43,400 USD. However, you can get a pre-owned version for about 34,200 USD. If two time zones are enough for you, the Overseas Dual Time might be just what you're looking for. 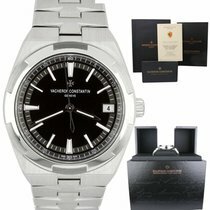 You can purchase this stainless steel watch for around 22,900 USD new. As it is a relatively new watch, pre-owned examples of the Dual Time are hard to come by. The Overseas Chronograph Perpetual Calendar is the highlight of the Overseas collection. This red gold watch costs about 72,800 USD new and 66,900 USD pre-owned. The luxury watches in the Historiques collection pay homage to Vacheron Constantin's historic watch models. That being the case, the designs of current Historiques watches are very traditional. The pillow-shaped Historiques American 1921 really stands out thanks to its dial, which is turned 45 degrees to the right, and the crown on the upper right corner of the case. If you decide on a mint-condition model in red gold, plan on spending around 29,000 USD. Pre-owned examples cost about 4,700 USD less. The platinum edition demands about 38,200 USD new and 30,800 USD pre-owned. The traditional Historiques Cornes de Vache 1955 chronographs are yet another high point in this series. The scales and numbers on their dials make them feel functional while remaining classically elegant. The two subdials at 3 and 9 o'clock give these watches a very straightforward look. Mint-condition pieces in red gold cost about 47,200 USD, while pre-owned examples sit around 35,200 USD. Be sure to set aside around 59,000 USD for a never-worn platinum model. Pre-owned pieces sell for about 47,000 USD. The highlight of this collection is the Vacheron Constantin Historiques Triple Calendrier 1948 . In addition to the date and day of the week, this watch also displays the month and moon phase. You can purchase this gold watch in mint condition for 31,700 USD. As a newer model, very few pre-owned pieces exist on the market. Watches in the Traditionnelle series honor Genevan haute horlogerie. This explains their elegant construction and why some are even elaborately skeletonized. The Traditionnelle Perpetual Calendar Openworked is particularly stunning. This red gold timepiece sells for about 127,000 USD new. The Traditionnelle Calibre 2755 is even more complicated. It features a tourbillon, minute repeater, perpetual calendar, and power reserve indicator. Be sure to have at least 622,000 USD on hand for this 44-mm gold watch. Expect to pay even more for the platinum version, which demands over 655,000 USD. The simple watches in this series are much more affordable. Some models are wonderfully understated such as those that display the time using only two hands. In red gold, this perfect dress watch costs around 25,800 USD. Pre-owned examples often cost a few thousand dollars less. The price for the platinum version of the two-hand watch sits around 54,000 USD. The Fiftysix joined the Vacheron Constantin family in 2018. These watches pay tribute to a model from 1956 by taking its design and embellishing it with modern elements. In its first year, this timepiece was released as a simple three-hand watch with a day-date display or as a complete calendar model. Although the latter displays the month in addition to the day and date, you still have to correct it manually five times a year. However, the moon phase display stays accurate for 122 years. A new Vacheron Constantin Fiftysix in stainless steel costs about 23,500 USD. The red gold version has a list price of 36,800 USD. Three-hand models with a date display at 3 o'clock are markedly less expensive: You can purchase the stainless steel version for 11,900 USD and the red gold edition for 19,900 USD. A Fiftysix Day-Date costs 17,900 USD in stainless steel and 33,400 USD in red gold. The Genevan Seal attests to a watch's quality and origin. It proves that a watch was assembled and inspected in the Canton of Geneva. The law it is based on has existed since 1886, making the Genevan Seal one of watchmaking's oldest seals of quality and origin. The certification criteria are updated regularly and apply to the whole watch: its water resistance, functions, accuracy, and power reserve. The TIMELAB foundation – the Genevan Laboratory of Horology and Microengineering – has been responsible for awarding the Genevan Seal since 2009. Most Vacheron Constantin watches come with a Genevan Seal. The manufacturer has had their watches certified since 1901, meaning Vacheron Constantin can look back on over 100 years of experience creating excellent watches. What's more, their watchmakers' training and the construction of their watches all follow the strict criteria of the Genevan Seal. Jean-Marc Vacheron founded his watch workshop in 1755. His grandson, Jacques Barthélemy, brought François Constantin on board in 1819. Together, they laid the groundwork for Vacheron Constantin's continued international success. Georges Auguste Lechot, a Genevan watchmaker, became the technical director of Vacheron Constantin in 1839. He was the first to introduce the mass production of watch components. This new process improved the quality and accuracy of pocket watches. The manufacturer began offering wristwatches in 1889, nine years before the introduction of the Maltese Cross as the company logo. This logo remains the symbol of the manufacturer to this day. Vacheron Constantin has been creating custom-made watches upon request for generations. These unique pieces embody the manufacturer's philosophy to always strive for perfection and their desire to craft the most exquisite luxury watches.